TAYLOR AND THE "ART OF SWEATING"
According to the founding father of modern industrial management, the conscious "restriction of output" or "soldiering" has always been the original sin of the working class. "The natural laziness of men is serious," Frederick W. Taylor wrote, "but by far the greatest evil from which both workmen and employers are suffering is the systematic soldiering which is almost universal." Taylor's lifelong crusade against the "autonomous and inefficient" worker was the crystallization of his personal experiences as a foreman at the Midvale Steel Company in Philadelphia. For three years he waged a relentless campaign against the machinists and laborers whom he accused of collectively restricting plant output. He was finally able to break up the group cohesion of the workers and reduce "soldiering" only after a ruthless dose of fines and dismissals. This pyrrhic victory took "three years of the hardest, meanest, most contemptible work of any man's life...in trying to drive my friends to do a decent day's work." It convinced Taylor that repression alone was an inadequate foundation for management control over the conditions of production. After further years of experimentation in the steel industry and in tool-and-die shops, and with the occasional backing of key corporate leaders from Bethlehem Steel and other large companies, Taylor systematized his theories in a series of books. Of his several works, however, his bluntly written PRINCIPLES OF SCIENTIFIC MANAGEMENT popularized his ideas most effectively. Eventually, after being translated into a dozen languages, this book became a bible to "efficiency men" all over the world. Here Taylor proposed effective solutions to the problems of reduced output and "soldiering." The traditional basis of soldiering, he explained, was the degree of job control exercised by skilled workers through their mastery of the production process. Craft exclusivism, maintained by control over entry into workforce and the monopolization of skills almost as an artisanal form of property, blocked the operation of free-market forces upon both the wage scale and employment. Taylor, moreover, recognized that the submission of the work force to the new discipline of the assembly line would not automatically resolve these problems as long as even a minority of the personnel preserved the right to define a "fair day's work". He emphasized that the crucial precondition of complete management power was the appropriation from the skilled workers of the totality of their craft secrets and traditions. The techniques of time and motion study developed by Taylor (and later perfected by others) were precise methods for analyzing the content of craft skills involved in the production process. These "scientific" studies conducted by the new-fangled production engineers and acolytes of Taylorism became the basis for undermining the autonomy of craft labor. Knowledge of the production process would be monopolized by management, while craft skills were simultaneously decomposed into simpler, constituent activities. While scientific management demanded the progressive "dequalification" of labor's craft aristocracy, it also signaled a new slavery for unskilled workers. As Taylor recognized, even gangs of common laborers, unorganized and lacking a property right in a craft, frequently were able to convert the solidarity of their work group into an effective brake on increased output. Management, he argued, had to aim at destroying the solidarity of all functional work groups, skilled or unskilled. Managers have always known that even in the absence of trade-union recognition the primary work group (defined by common tasks, skills, or departments) is a natural counter-pole to management authority and the basis for collective counter-action. The daily work group constitutes a social unit for the individual worker almost as intimate and primal as the family. It is the atom of class organization and the seed from which great co-operative actions of the working class have always developed. Before Taylor, however, there was no practical strategy for preventing the crystallization of primary workgroups in which wage earners grew to depend on each other and to co-operate in resisting management authority. In order to prevent the work groups from evolving into "counter-organizations," Taylor proposed a judicious combination of the carrot and the stick. First the most militant workers - the organic leadership - were fired or severely fined for the slightest infraction of the new rules. Then jobs were diluted, redesigned and "individualized" (that is, fragmented and serialized) to the greatest extent technically feasible. Finally, differential piece or time rates were introduced to promote competition and to sponsor the emergence of a new pseudo-aristocracy of "first-rate men" working from 200% to 400% above the new norms. And so, out of the old mixture of skilled and unskilled labor, Taylorism helped precipitate the archetypal worker of the future: the machine tender, the semi-skilled operative with the discipline of a robot. Taylor loved to argue that workers should be selected on the same "sensible" basis on which draft animals were discriminatingly chosen for separate tasks. The working class were divided by nature into groups of weak mules, ordinary drays, and super-strong work horses. Co-operation, Taylor explained, meant that future workers "do what they are told to do promptly and without asking questions or making any suggestions." The inter-dependency of workers - previously expressed through their teamwork of conscious co-operation - would be replaced by a set of detailed task instructions prepared by management to orchestrate the workforce without requiring any initiative from the bottom up. Taylor also advised bosses to reduce the on-the-job socializing of workers through vigilant supervision and frequent rotation. In principle, the only tolerable relationships within a Taylorized plant would be the chains of command subordinating the workers to the will of the management. The real message of scientific management, therefore, is not about efficiency; it is about power. Like many other aspects of the Progressive Era, it was a counter-revolutionary blow at the potential power of the working class to organize itself and transform society. The fundamentals of scientific management had been introduced into the basic manufacturing core of U.S. industry by the eve of American entry into World War I. Corporate capitalists were determined to install the reign of the "iron heel" within their plants, mills, and mines. Taylorism offered coherent principles and an ideological framework to corporate managers searching for a strategy to deal with labor relations at a time when higher and higher targets of productivity were being demanded by the capitalists. Scientific management gave U.S. industry an inestimable advantage in the world market. American production was generally recognized as the most intense in the world, with speed-up and working conditions which frequently scandalized observers from the European labor movement. As Antonio Gramsci reflected in one of his PRISON NOTEBOOKS, scientific management in the U.S. represented "the biggest collective effort to date to create with unprecedented speed and with a consciousness of purpose unmatched in history a new type of worker and man ... Taylor is in fact expressing with brutal cynicism the purpose of American society." A good deal has been written about the American Federation of Labor's response to scientific management, from its initial strong opposition to its eventual conciliation (or capitulation). However, the response to Taylorism among unskilled or immigrant workers has been explored only recently. And very little is known about the reaction of the radical Industrial Workers of the World. Although the Wobblies have received much attention in the last decade, they have not been taken as seriously as they should. In contrast to the A.F.L. 's narrow defense of endangered craft privileges, the Wobblies attempted to develop a rank-and-file rebellion against the rationality of Taylor and the speed-up. In fact, they were virtually unique among American labor organizations, in their time or any other, in their advocacy of a concrete plan for workers' control. Nothing illustrates the specificity of I.W.W. industrial unionism better than the I.W.W. 's role in the wave of mass strikes initiated by Eastern industrial workers from the first detonation at McKees Rocks, Pennsylvania in 1909 through the Detroit auto strikes of 1913. Historians have yet to put these strikes in their proper perspective. Even Jeremy Brecher, searching in his recent STRIKE! for the central role of mass spontaneity in American labor history, virtually ignores this whole period of class conflict which included major strikes at McKees Rocks, East Hammond, New Castle, Lawrence, Passaic, Paterson, Akron, and Detroit. In all these strikes the I.W.W. played a crucial role. Together with the concurrent mobilization of socialist-led garment workers in New York and elsewhere, these struggles marked the entry of the "submerged" majority of industrial workers into open class conflict. "Common labor" had long been considered unorganizable because of the ethnic divisions and racism, the hostility of skilled native labor, the inexhaustible reserve army of new immigrants, and corporate management's unprecedented apparatus of spies, cops and finks. Therefore, the sudden and dramatic awakening of semi-skilled factory workers, despised and ignored by the craft unions, constituted, in the words of William English Walling, "nothing less than a revolution in the labor movement." It is particularly significant that the storm centers of these strikes were located in the industries being rationalized by scientific management and the introduction of new mass-assembly technologies. A survey of conditions and complaints in the struck plants vividly reveals how the tactics of scientific management (time study, task setting, efficiency payments, etc.) had invariably resulted in extreme job dilution, speed-up, and a lowering of wages. Before he reduced wage rates in 1907, President Frank Hoffstot had also introduced a new assembly line production method which accelerated the pace of work through a piece-rate system. At the same time he devised a technique for pooling wages which penalized all members of a labor pool for time and production lost by any single slow worker. This new production system also penalized workers for delays caused by company failure to repair machinery, and for breakdowns caused by vague instructions issued by plant superintendents. Although compelled to work at a feverish pace in order to satisfy the pool's production target, the men on the assembly line never knew what their actual piece rates would be and, in fact, usually found their weekly earnings well below expectation. Summarizing the conditions which led to the great strike of 1909, John Ingham's study of McKees Rocks concludes that "it was this rigorous but logical extension of the ideas of scientific management which led directly to the McKees Rocks Strike of 1909." Similarly, the Lawrence strike was precipitated by a premium system that enforced speed-up and by a wage cut-back following the passage of the 54-hour work week for women and children. At Paterson, the silkworkers were driven to desperate rebellion by the introduction of the multiple-loom system, an especially fatiguing variety of speed-up which made weavers responsible for twice as many looms as before. In the Akron rubber industry, Philip Foner's analysis of the 1913 uprising shows that "the conditions the workers found made an eventual outburst inevitable. The speed-up system prevailed throughout the industry. A Taylor-trained man with a stop watch selected the speediest workers in a department for tests, and thereafter wages for the whole department were determined by the production of the fastest workers." Later in testimony before the Senate committee investigating the strike, "strikers told of the inhuman Taylor speed-up system in the plants, and even the employers, in their testimony, boasted that as a result of the speed-up system 'we got 40% more production with the same number of men.'" The steady mechanization of the industry reduced the skilled workers to a small fraction of the total number in the industry. The majority of the auto workers became mere machine operators with a job that could be picked up in a few hours. In no other industry was the process of production more subdivided and specialized or speed-up more prevalent. Pace setters under the direction of 'speed kings,' as they were called by the workers, with stop watches in hand, timed the men on every operation. A standard was thus obtained by which every job was to be done. If a worker failed to meet the standard, he was discharged. Two years before the I.W.W. became involved in the auto strikes, the INDUSTRIAL WORKER printed a representative plea for help from "Only a Muff" working in a plant of 7,500 where time-and-motion men had just increased the mandatory output from 150 to 225 units a day. This unknown auto worker told the I.W. readership how the men in his department were planning to restrict output and to refuse to compete against one another for efficiency payments. He added, however: "Of course we can't fight alone. If they insist upon this new system, it will be a case of either eat crow or quit. Let some of those free speech fighters come here and get on the job!" Scientific management did not - as Taylor liked to claim - ensure that workers "look upon their employers as the best friends they have in the world(!)" Rather, it sowed class conflict on an epic scale. In the particular circumstances of 1909-1914, moreover, when the Depression of 1907 led to a quickening in the economy's rhythm of explosive growth and sudden slump, scientific management posed an especially clear threat to the working class. Upon the basis of sharp economic fluctuations and chaotic disruptions in the labor market, Taylorization helped ensure that rising productivity could be realized without restoring wages to pre-1907 levels. It also retarded the recovery of employment from depression levels. A.F.L. craft unions of course suffered a stunning debacle during this period in their remaining strongholds (especially steel) within basic industry. But for the mass of semi-skilled workers, whom the A.F.L. did not represent in any sense, the craft unions' fate was largely irrelevant. Undetected by A.F.L. leaders and other observers, who were misled by chauvinist stereotypes of the "new immigrants", a rank-and-file leadership was shaping up among the semi-skilled workers. The immigrant factory proletariat could be united as well as divided by the diversity of its component cultures. Native traditions of revolution and struggle were brought to American soil along with the restricting consciousnesses of the shtechtl or ancestral village. The high rates of immigration and internal job turnover made organization difficult, but these trends also produced an unprecedented circulation of ideas and experiences in the American labor movement. The unique degree of back-and-forth movement of foreign workers in the immediate pre-war period, at a time of world-wide labor upheaval, temporarily opened America to the diffusion of diverse ideas and experiences drawn from the breadth of European revolutionary movements. There were not many immigrant workers with the activist background of a Singer employee named James Connolly, recently arrived from Ireland, or the unnamed steel worker whom William Trautman talks about who had led in the Moscow uprising during the 1905 Revolution, but they were not unique. The I.W.W. had a particular attraction for the most advanced immigrant workers, and their combined experiences constituted an important reservoir of ideas and tactics for the organization. The I.W.W. 's very slow growth before late 1909 disguises the fact that the Wobblies already had semi-organized groups at Lawrence and Paterson which were helping to build a foundation of militancy. At Paterson there was an eight-year history of Wobbly agitation before the great strike of 1913. The Lawrence I.W.W. local had initiated a series of slowdowns and wildcat walkouts against speed-up in the summer of 1911. This committee quietly took charge of the strike, planned the tactics of the battle, and put into operation methods of strike strategy which, though used often in Europe, were new to the American labor movement and were to influence the conduct of strikes among the foreign-born workers for many years to come. Among the McKees Rocks strikers, the committee was known as the "Kerntruppen", a term derived from the military system of Germany where it referred to a "choice group of fearless and trained men who may be trusted on any occasion." The I.W.W. supported these small industrial cadres with the skills of experienced, full-time organizers, including Italians like Arturo Giovannitti and Joseph Ettor, the young Irish Republican James Connolly, as well as noted Americans like "Big Bill" Haywood and Elizabeth Gurley Flynn. Well-versed in U.S. labor history, but unafraid to borrow from the international repertoire of the syndicalists and other militants, the Wobblies were particularly adept at turning the weaknesses of immigrant strikers into sources of strength. Ethnic cohesiveness, traditionally so divisive, became a wellspring of unity when strikes were organized on a radically democratic basis with strictly representative committees that could be recalled. Leaflets, speeches, and songs were presented in every language, while in each strike every conceivable parallel was found with the historic struggles of various European nationalities. While the solidarity and internationalism which the Wobblies strove to create within each strike was very important, the I.W.W. members also functioned as a transmission belt between strike movements. The big uprisings in steel and textiles seemed particularly important in providing a basis for organizing mass industrial unions. McKees Rocks, for instance, catalyzed strikes throughout the entire railroad-car construction industry, and the I.W.W. was able to establish short-lived locals in every major center of the industry (Hammond, Woods Run, Pullman, Hegewisch, and Lyndera). A little later the Lawrence and Paterson strikes transformed the I.W.W. 's affiliate Industrial Union of Textile Workers into a movement of many thousand workers. The shock waves of these big struggles reverberated throughout Eastern industry and found resonance in the dozens of smaller strikes influenced by the I.W.W. in the same period. "Fishing in troubled waters" during his 1913 organizing tour of Pennsylvania and Ohio, General Organizer George Speed found the electricity of class struggle everywhere. In a few whirlwind months during the Akron rubber strike, he chartered new locals or contacted strikers across the entire spectrum of the working class: steel workers, railroaders, electrical equipment makers, barbers, construction laborers, department-store employees, sugar refiners, safe makers, shoemakers, tailors, furniture makers, wire workers, match workers, and railroad car repairers. The I.W.W. membership statistics presented at the 1911 and 1913 conventions provide a dramatic measure of the organization's growing implementation in the major Eastern industrial centers. As is well known, the I.W.W. failed to consolidate large numbers of Eastern industrial workers into its ranks. Between April and August of 1911, for example, even as 70 new locals were being organized, the disbanding of 48 old locals for reasons such as "lack of interest" was registered. But it has to be remembered that the A.F.L. was also in deep crisis. It endured the crushing of the Amalgamated by the steel trust and did little or nothing to aid the epic two-year struggle of railroad shopmen who organized on industrial lines to resist the introduction of scientific management on the Harriman lines. Given the troubles of the labor movement in general, it is wrong to view the period as one in which the I.W.W. demonstrated an inherent inability to build durable union organizations. The insurgency of 1909-1913 shaped a rank-and-file vanguard for the next, even more intense period of struggle in 1916-1922. I.W.W. members recognized that the industrial working class would not be organized in one single leap forward. Instead, the Wobblies saw the need for the forging of a "culture" of struggle among immigrant workers and the creation of a laboratory to test the tactics of class struggle. These years saw a vigorous debate on industrial strategy both within the I.W.W. and between its partisans and the rest of the American left. Having traced some of the origins of the pre-war strike wave to the impact of scientific management, it is time to consider the famous, somewhat enigmatic controversy over "sabotage" and its relationship to I.W.W. practice in the Taylorized mills and plants. In his exhaustive 1904 investigation of the REGULATION AND RESTRICTION OF OUTPUT for the Secretary of Labor, John Commons observed that "nowhere does restriction of output as a substitute strike policy exist in the United States." Eight years later, however, the INDUSTRIAL WORKER weekly regaled its readers with examples of successful "sabotage," and the Socialist Party recalled I.W.W. leader Big Bill Haywood from its Executive Committee for advocating sabotage. Haywood's 'cause celebre' arose from a speech he gave before a huge crowd at New York's Cooper Union in 1911, where he declared, "I don't know of anything that can be applied that will bring as much satisfaction to you, as much anger to the boss as a little sabotage in the right place at the right time. Find out what it means. It won't hurt you and it will cripple the boss." His unrestrained oratory prompted the adoption of an anti-sabotage clause in the party constitution, the famous Article II, Section 6 which forced the exodus of Haywood and several thousand left-wing socialists from the party and completed the polarization of the radical labor movement into bitterly hostile right and left wings. Soapboxers found that talk of sabotage gave their audiences a thrill, and since the dispensers of the above publications (the Cleveland I.W.W. Publishing Bureau) were happy to send them for sale on commission to all who would handle them, there was nothing to stop spielers, whether they were I.W.W. members or not, from procuring these booklets, mounting a box, talking about the I.W.W., taking up a collection, and selling the literature. The problem with the traditional explanation of I.W.W. advocacy of sabotage is that it does not explain why the sabotage debate split the Socialist Party or why the Wobblies persisted in making sabotage a central slogan in the period from the end of the McKees Rocks strike through the auto walkouts in 1913. ("Sabotage" made its first published appearance in a 1910 article in the INDUSTRIAL WORKER and appeared with increasing frequency until it became the theme of a serialized weekly discussion.) Unless the I.W.W. spokesmen are dismissed as irresponsible and flippant rabble rousers, it remains to be shown why this organization, temporarily inserted into the leadership of a massive upheaval of unorganized workers, gave such priority to its "flirtation" with a foreign-made notion which it supposedly never implemented on any serious scale. Much of the confusion about what the Wobblies really meant by "sabotage" stems from the fact that revolutionaries, especially in the pre-Leninist period, were forced to borrow old concepts or to employ only vaguely approximate analogies of practice in order to express the very different connotations of a new or transformed arena of struggle. A careful reading of the I.W.W. literature concerning sabotage in this period reveals the striking mixture of old ideas and new which can be analytically reduced in each case to three fundamental and differing meanings of "sabotage". These three dimensions of "sabotage", in turn, correspond to different, historically specific tactics of the labor movement. First, there is the meaning frequently assigned by Bill Haywood that sabotage was only the frank, open advocacy of the same "universal soldiering" practiced by most workers. In this sense, "the conscious withdrawal of the workers' industrial efficiency" boils down to the familiar and inherently conservative tactic which had been one of the main bases of craft unionism. Moreover, it was precisely this traditional form of job control through conscious self-regulation of the pace which, as we have seen, Taylorism and speed-up were dissolving through the transfer of total control over working conditions to management. It was in Europe, where industry was less rationalized, that the old conservative application of soldiering was still a ubiquitous safeguard of traditional worker prerogatives. Second, "sabotage" sometimes carried that inflammatory connotation which so terrified right-wing socialists like Victor Berger - who thought he saw the ghost of anarchist bomber Johann Most in the I.W.W. The retaliatory destruction of capitalist property (and occasionally persons) was an unspoken but familiar tactic in American labor struggles. Undoubtedly the I.W.W. had some first-hand knowledge of the efficacy of the match or fuse in Western labor struggles involving brutally terrorized miners, agricultural laborers, or lumberjacks. Workers in these industries had a long international tradition - "Captain Swing", "Molly Maguires", Asturian and Bolivian "Dynameteros", etc.- of using "sabotage" as a last resort against the daily experience of employer violence. In contrast, the Wobblies, while far from being pacifists, channeled the rebellion of Western workers into industrial unionism and new, essentially non-violent forms of struggle like the free-speech campaigns. These tactics helped break down the isolation of the casual laborer from workers in the towns and turned the migrant into a sophisticated and self-sufficient political agitator. In Lawrence one of the reasons for the settlement of the strike on terms favorable to the strikers was the fact that the employers feared that the cloth might not be produced in the best of conditions by workers who were entirely dissatisfied. This knowledge, shared by the strikers, gave to the toilers the feeling that they were a necessary portion of the social mechanism and brought them that much nearer the time when the workers as a class shall feel capable of managing industry in their own interests. It appears that the Wobblies rarely went ahead and actually brought the "fire next time", in the form of retaliatory destruction, down upon the heads of the bosses. Their typical emphasis in discussing sabotage was on a third meaning of the word, as a mass tactic requiring some form of continuing, although clandestine, mass organization in the plant or mill. Sabotage is clearly defined as a flexible family of different tactics which effectively reduce output and efficiency. Old-fashioned soldiering or the retaliatory destruction of capitalist property are merely potential applications, under specific conditions, of a much more diverse strategy which also included the "open mouth strike" (purposeful disruption by observing every rule to the letter) and (above all) the hit-and-run slowdown. The essence of the Wobbly advocacy of sabotage was to encourage the creativity of the workers in the discovery of different tactics. When moulded to the particularities of specific industries, these tactics could be applied directly on the job with maximum effect (whether or not union organization was recognized) and with a minimum danger of company retaliation against individual workers. Although little is really known about the history of unofficial job actions, there is good reason to believe that the I.W.W, focused especially on systematic sabotage through repeated slowdowns and short, sporadic strikes. The relationship of these tactics to the overall Wobbly strategy is forcefully summed up by Elizabeth Gurley Flynn: "Sabotage is to the class struggle what guerrilla warfare is to the battle. The strike is the open battle of the class struggle, sabotage is the guerrilla warfare, the day-to-day warfare between two opposing classes." Many who condemn sabotage will be found to be unconscious advocates of it. Think of the absurd position of the "Craft Union Socialists" who decry sabotage and in almost the same breath condemn the various efficiency systems of the employers. By opposing "scientific management" they are doing to potential profits what the saboteurs are doing to actual profits. The one prevents efficiency, the other withdraws it. Incidentally, it might be said that sabotage is the only effective method of warding off the deterioration of the worker that is sure to follow the performance of the same monotonous task minute after minute, day in and day out... Sabotage also offers the best method to combat the evil known as "speeding up". None but the workers know how great this evil is. The INDUSTRIAL WORKER also unhesitantly advised direct action to deal with the problem of the worker, bribed by efficiency payments or promised promotion, who broke group solidarity and became a "speeder". After comparing the function of the "speeder" to the "favorite" steer trained to lead his fellow creatures into the killing pen, it was suggested that "... in the steel mills this speeding up process has become so distressing to the average worker that still greater steps are taken for self-protection. In fact in speaking of these class traitors, it is often remarked that it is something dropped on their feet that often affects their brain." ...we believe that it (scientific management) builds up in the industrial world the principle of sabotage, syndicalism, passive resistance, based on economic determinism. We did not hear of any of these things until we heard of scientific management and new methods of production... we find that when men can not help themselves, nor can they get any redress of grievances, and are forced to accept that which is thrust upon them, that they are going to find within themselves a means of redress that can find expression in no other way than passive resistance or in syndicalism. But many representatives of the labouring masses, including well-known I.W.W. members, either attach little importance to such extreme methods or positively oppose them. To withdraw the "efficiency from the work", that is, to do either slower or poorer work than one is capable of doing, is also a mere continuation and systematization of a world-wide practice which has long been a fixed policy of the unions of the aristocracy of labor. But its object in their hands was merely to enable the workers to take things easy, to increase the number of employed, and so to strengthen the monopoly of skilled craftsmen. The laboring masses have now completely revolutionized the motive as well as the method. In order to influence employers the output can no longer be restricted on all occasions. The work must be good and fast when the employer does what labor wants. It is a pity, then, that there is for this practice not some middle expression between the old term, ca'canny, which means intermittent restriction of output, and the new term, sabotage, which often means almost any kind of attack on the employer or his business. But what I want to emphasize at this point is that, in proportion as the scientific methods of increasing efficiency are applied in industry, one of the laborers' best and most natural weapons is the scientific development of methods of interfering with efficiency, which methods, it seems, are likely to be lumped together with entirely different and often contradictory practices under the common name of sabotage. Walling also analyzed the strategy he saw emerging from the mass strike movement and described a system of "provisional agreements", unbound by legal contracts, and enforced by intermittent strikes. Despite the fact that the Wobblies would almost certainly have rejected his introjection about sometimes encouraging workers to do their jobs "good and fast," PROGRESSIVISM AND AFTER captures a deeper aspect of I.W.W. tactics, particularly the degree to which a bold and coherent action strategy was emerging on premises radically different from the liberal goal of "institutionalized collective bargaining". Despite the occasional rhetorical extravagances of a few I.W.W. spokesmen like Arturo Giovannitti - who loved to talk about sabotage as the "secret weapon" of the working class - it was never seen as an isolated panacea. The Wobblies were less fetishistic about their methods than any other labor organization in American history. "Tactics are revolutionary only as they are in accord with revolutionary ends," said the I.W.W. paper. No exact formula can be set down as the proper tactics to pursue, for precisely the same action may be revolutionary in one case and reactionary in another." In a 1912 INDUSTRIAL WORKER article, Louis Levine pointed to the real essence of the Wobblies' direct-action tactics: "Sabotage is not considered by the apostles of direct action as the only efficacious or even the most appropriate means of struggle. IT IS THE SOLIDARITY OF THE WORKERS THAT IS OF DECISIVE IMPORTANCE." Second..... Don't give long notices to the employer what you intend to do. Third........ Avoid premature moves and moves at the wrong time. Fourth....... Avoid as far as possible the use of violence. Fifth.......... Use force of public education and agitation; the union is an agitational and educational force for the workers. Seventh...... Passive strikes and sabotage, irritant strikes. Tenth......... Where possible seizure of warehouses and stores to supply strikers or locked out men. It is important to remember that at this time the formal labor contract and time agreement was one of the methods by which craft unions had preserved their control over the work place. The Wobblies pointed out that "...the time agreement under which the workers of each craft union are given a closed shop is often as bad for the workers as a whole as an open shop, because, under its terms, contracting craftsmen are bound to scab on the other workers." At McKees Rocks, New Castle, Akron and Paterson, the immigrant workers had seen their struggles broken by the native, skilled workers who signed independent agreements with the bosses and used them as legal cover to break strikes. In contrast to the maintenance of the closed shop by legal agreement and external compulsion, the I.W.W. proposed an entirely different concept of shop control based on voluntary self-organization and shop-floor direct action (sabotage) to resolve grievances and preserve conditions won in previous strikes. 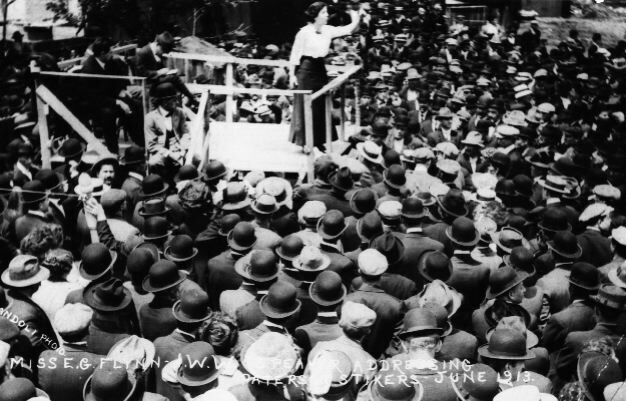 During the Brooklyn Shoe Strike of 1911 the Wobblies introduced the "shop committee". "The I.W.W. shop organization developed technical knowledge in the working class and prepared it to take over technical management." Furthermore, the I.W.W. local union, borrowing and extending the European precedent of the MAISON DU PEUPLE, functioned as a high-energy agitational and educational force: "not only a union hall but an educational and social center." Finally, by building entirely upon a basis of voluntary membership and rank-and-file activism, with a minimal full-time staff, the Wobblies told astonished questioners that they were "...doing away with the professional labor leader." ... we have the partial strike, the passive strike, the irritant strike, and the general strike - one continual series of skirmishes with the enemy, while in the meantime we are collecting and drilling our forces and learning how to fight the bosses. The short strike is not only to pester the employer; it is like army drill, to become the school of practice in preparation for the coming general or universal strike. Sabotage was thus conceived as both a means of achieving some degree of shop control in scientifically managed factories, and also as an integral part of the "greviculture" (strike culture) preparing the American working class for the Social Revolution. Unfortunately we know very little about the actual development of job-action tactics and sabotage within the concrete context of individual factories. The daily building of collective organization on a plant level and the ceaseless guerrilla warfare against management's despotism constitute a "terra incognita" for historians. Staughton Lynd's ground-breaking interviews with rank-and-file steel workers, which challenge so many accepted theories of the C.I.O., demonstrate how vital this dimension of labor history is for a real understanding of the struggle to build industrial unionism. Judging the importance or "marginality" of the I.W.W. in the Progressive Era by the Wobblies' failure to actually construct the One Big Union or to found permanent locals ignores the fact that the mass strikes of 1909-1913 transmitted a valuable arsenal of new tactics and organizational weapons to the industrial working class. Though the I.W.W. failed to reach many workers struggling against scientific management within the A.F.L., the Wobblies' dual unionism allowed them to take a new course in developing direct-action strategies that would be used in later industrial struggles. Without romanticizing the I.W.W., we should take it seriously as the only major labor organization in the U.S. which seriously and consistently challenged the capitalist organization of production. In our own time, when "virtually all manufacturing operations in the industrial world are based on an application of scientific management rules" and when workers from Lordstown to Lip are actually struggling to break those rules and to challenge the managers who make them, the old confrontation between the stop watch and the wooden shoe still has living significance. The author thanks Paul Worthman and James Green for their help on this article. Frederick W. Taylor, PRINCIPLES OF SCIENTIFIC MANAGEMENT (New York, 1911), p. 13. Taylor before the Commission on Industrial Relations, April 13, 1914. REPORT AND TESTIMONY, Vol. 1 (Washington, 1916), p. 782. For a description of Taylor's aberrant personality, including his habit of chaining himself at night to "a harness of straps and wooden points", see Samuel Haber, EFFICIENCY AND UPLIFT: SCIENTIFIC MANAGEMENT IN THE PROGRESSIVE ERA, 1890-1920, Chicago, 1964. For a provocative description of the degree of job control exercised by skilled workers before the advent of rationalization, see Katherine Stone, "Origin of Job Structures in the Steel Industry", RADICAL AMERICA, Nov.-Dec. 1973. John P. Frey, "Modern Industry and Craft Skills", AMERICAN FEDERATIONIST (May 1916), pp. 365-66. Cf. Andre Gorz's summary: As a whole, the history of capitalist technology can be read as the history of the dequalification of the direct procedures." Andre Gorz, "The Tyranny of the Factory", TELOS (Summer 1973), pp. 61-68. For a sample of contemporary analysis of the primary work group by industrial psychologists see Leonard Sayles and George Strauss, HUMAN BEHAVIOR IN ORGANIZATIONS, New York, 1966. For another view see M. Guttman, "Primary Work Groups", RADICAL AMERICA May-June 1972. At Bethlehem Steel output was almost doubled after adoption of a variation of the bonus payment, but the "shop employed 700 men and paid on the 'bonus' plan only 80 workers out of the 700." Louis Fraina, "The Call of the Steel Worker", INTERNATIONAL SOCIALIST REVIEW (July 1913), p. 83. Taylor, op. cit., pp. 765-810. Taylor, "Why Manufacturers Dislike College Graduates", quoted in Haber, pp. cit., p. 24. See Paul Devinat, SCIENTIFIC MANAGEMENT IN EUROPE (Geneva, 1927). Antonio Gramsci, "Americanism and Fordism", in PRISON NOTEBOOKS (London, 1971), p. 302. Haber, op. cit. ; Milton Nadworny, SCIENTIFIC MANAGEMENT AND THE UNIONS (Cambridge, 1955); and Jean McKelvey, A.F.L. ATTITUDES TOWARD PRODUCTION (Ithaca, 1952). William English Walling, "Industrialism or Revolutionary Unionism? ", THE NEW REVIEW (Jan. 18, 1913), p. 88. Melvyn Dubofsky, WE SHALL BE ALL: A HISTORY OF THE I.W.W. (Chicago, 1969), pp. 200-201. John N. Ingham, "A Strike in the Progressive Period", THE PENNSYLVANIA MAGAZINE OF HISTORY AND BIOGRAPHY (July 1966), p. 356. Philip Foner, THE INDUSTRIAL WORKERS OF THE WORLD 1905-1917 (New York, 1965), pp. 374, 382. Letter from "Only a Muff", INDUSTRIAL WORKER, Dec. 22,1911. Commission on Industrial Relations, op. cit., Vol. 1, p. 772. Ibid., pp. 132, 141-43. Unemployment was 11.6% in 1910, 13% in 1911, 9% in 1912, 8.2% in 1913, and 14.7% in 1914. See Stanley Lebergott, MANPOWER IN ECONOMIC GROWTH (New York, 1964), p. 512. "The immigrant laborer, furthermore, had one standard remedy for disgust with his job: he quit... Annual turnover rates ranging from 100-250% of the original labor force were found to be commonplace. Ford Motor Company hired 54,000 men between October 1912 and October 1913 to maintain an average work force of 13,000." David Montgomery, "Immigrant Workers and Scientific Management", unpublished paper, 1973. Foner, op. cit., p. 353, and Dubofsky, op. cit., p. 234. Foner, op. cit., pp. 287-88. Also see Ingham,op. cit., pp. 363-77. See Report of General Organizer George Speed in the STENOGRAPHIC REPORT OF THE EIGHTH ANNUAL CONVENTION OF THE I.W.W., 1913. At the 1911 convention there were 21 voting locals plus the national textile union, and 14 of these were either western or based in mining districts. By the 1913 convention the number of voting locals had grown to 89 plus the textile union, and 38 of the locals (including four of the five largest according to the number of proxy votes) were Eastern. Report of General Secretary-Treasurer Vincent St. John, STENOGRAPHIC REPORT OF THE SIXTH CONVENTION OF THE I.W.W., 1911, and the EIGHTH CONVENTION, 1913. REGULATION AND RESTRICTION OF OUTPUT, Eleventh Special Report of the Commissioner of Labor (John Commons, ed., Washington, 1904), p. 28. The enduring complaint by manufacturers about employee soldiering and sabotage is reflected in Stanley Mathewson, RESTRICTION OF OUTPUT AMONG UNORGANIZED WORKERS, New York, 1931, and "Blue Collar Blues", FORTUNE, July 1970. "Haywood's Cooper Union Speech", INTERNATIONAL SOCIALIST REVIEW (February 1912), pp. 469-70. "Sabotage", by the way, was probably first adopted as an appropriate French translation of Ca' Canny in an 1897 report by Pouget and Delassle to the C.G.T. convention at Toulouse. It is derived from "coup de sabots", an idiomatic expression from clumsiness, and not, as often believed, from the mythic act of throwing the sabot (wooden shoe) into the gears. Foner, op. cit., p. 160. Dubofsky, op. cit., p. 163. Fred Thompson, THE I.W.W. : ITS FIRST FIFTY YEARS (Chicago., 1955), p. 86. Commission on Industrial Relations, op. cit., Vol. 1, p. 55. INDUSTRIAL WORKER, May 16, 1912. Melvyn Dubofsky, WHEN WORKERS ORGANIZE: NEW YORK CITY IN THE PROGRESSIVE ERA (Amherst, 1968), p. 124. Elizabeth Gurley Flynn, SABOTAGE (Chicago, n.d.), p. 4. INDUSTRIAL WORKER, Feb. 6, 1913. See also Editorial, Dec. 28, 1911, and the articles by Covington Hall, Nov. 16, 1911, and B. E. Nilsson, April 24, 1913. Editorial in INDUSTRIAL WORKER, Feb. 6, 1913. Commission on Industrial Relations, op. cit., Vol. 1, pp. 874-77. William English Walling, PROGRESSIVISM AND AFTER (New York, 1914), pp. 301-302. INDUSTRIAL WORKER, May 12, 1912. Louis Levine, "Direct Action", INDUSTRIAL WORKER, June 20, 1912. Will Fisher, "Industrial Unionism, Tactics and Principles", INDUSTRIAL WORKER. March 12, 1910. Fisher in INDUSTRIAL WORKER, March 19, 1910. "The more I see of the old unions the more I am convinced that we must fight them as bitterly as we fight the bosses; in fact, I believe they are a worse enemy of the One Big Union than the bosses, because they are able to fight us with weapons not possessed by the bosses." E. F. Doree, "Shop Control and the Contract: How They Affect the I.W.W. ", reported in the STENOGRAPHIC MINUTES OF THE TENTH CONVENTION, 1916. Doree's sectarianism must be seen in the light of the innumerable instances of strikebreaking by A.F.L. unions; the second walkout at McKees Rocks, for instance, was broken by armed native workers affiliated to the Amalgamated. (See Ingham, op. cit.) In other steel mills A.F.L. men gave the bosses the names of suspected Wobbly sympathizers. (INDUSTRIAL WORKER, Feb. 19, 1912. Justus Ebert, THE I.W.W. IN THEORY AND PRACTICE, 5th Revised Edition (Chicago, 1937), pp, 126-27. Fisher, op. cit., March 12, 1910. Joe Ettor, Commission on Industrial Relations, op. cit.. Vol. 2, p. 1555. INDUSTRIAL WORKER, Feb. 5, 1910. James Brooks, AMERICAN SYNDICALISM: THE I.W.W. (New York, 1913), p. 135. Staughton Lynd, ed., "Personal Histories of the Early C.I.O. ", RADICAL AMERICA, May-June 1972. George Friedmann, THE ANATOMY OF WORK (New York, 1961). Way cool. This article from "Radical America" is one of many good articles to appear in that publication. While never anarchist, RA ran many pieces and covered movements in the libertarian oriented "from below" movements. Carrying on the best traditions of SDS, from which it sprang. Great to see this on here, will give it a read when I have some time. For what its worth, Taylorist 'scientific management'*, while in this context a response to organised workers' power designed to break it up, also carries with it an array of worker dissatisfactions that can be used as grievances to aid the organising process. For example, management literature states that a high degree of 'task fragmentation' leads to apathy and disatisfaction. I wrote a bit about this here. Also, while Taylor crusaded against workers' autonomy, later management theories embraced it and promoted the idea of self-managing teams**. His accusation that the workforce collectively restricted their output, is something supported by the research carried out in studies at the Hawthorne plant in Illinois, which revealed the existence of informal groups with social control over production output. *Its scientific nature is highly disputable. ** To capital's benefit of course.